Spyralle is sponsoring the Faire again with the beauty of exquisite fractal creations. Kerryth Tarantal shares with us her reasons to relay, her earliest fantasy memories and her growth as a Second Life creator. You can read more in the last year’s interview here. This is not your first time sponsoring Fantasy Faire. Do you have personal reasons to support RFL? Do you want to share those with us? I am a 3-time cancer survivor, three different cancers. I was diagnosed with the first one almost 19 years ago. The most recent was five years ago. I literally owe my life to the research that has been made possible by the donations of thousands of caring people, and I want to pass it forward. I am passionate about this cause in SL not just because of my own experience but because of the people I know whose lives depend on continued research. Also the people we have lost. And, of course, the joyful experiences I’ve had and the wonderful people I’ve met, being engaged with Relay for Life in SL. This is truly a joy and a labor of love. I started very small, making simple prim things for one of my first homes in Second Life. I rented a little island, and the ground was not flat. I had to make a prim foundation to put under my house. It was like magic, and I remember thinking “Wow! I can do this!” I kept trying things, and then I took a basic building class, and there was no turning back. I had always loved creating things in RL – I make costumes and textile art and fractals – but this was like magic! I find inspiration everywhere – colors, textures, shapes – anything visual. I have been a fractal artist for years, and I always dreamed of applying the images I made to textiles, to my wearable creations, but it’s hard to translate these intricate images into media like embroidery, painting, beadwork. Printing is expensive, and compared to pixels, it is dark and dull. Second Life is a world made of light, the native medium of my fractal art. Creating things made of pixels seemed to be a natural direction. I am working on half a dozen projects. Whichever ones are farthest along by the last weekend in April are the ones that will appear at the Faire. If you want a teaser, look at everything new I’ve come out with since the beginning of the year. Look at my blog. Look at the hunt prizes. Hunts are my lab, my workshop. The pictures I’m sending give some hints. One thing that is safe to say is that there will be headpieces – accessories to be worn above the neck. Exactly which ones will make the grade in time is something that is yet to be determined. If you count fairy tales, I don’t even remember the first time. I had read every fairy tale collection I could get my hands on when I was in elementary school. I discovered modern fantasy as a teenager. The Lord of the Rings, of course. It was like coming home. Yes, THIS! This is what I have always been looking for! This is the imagination set free. 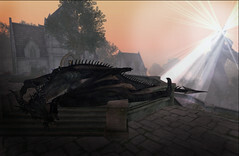 It didn’t hurt that fantasy was a genre in which people could be absolutely unapologetic about creating visual beauty. I am looking forward to being bowled over by the creative vision of everyone involved in Fantasy Faire. It is the most amazing, incredible visual feast one could ever hope to see. Every year I think, they’ll never top this. And then they do. To play a small role on that magnificent stage with all these wonderful, creative people is a delight and inspiration. It is the high point of my year in SL. And we have so much fun, don’t we? Thank you, Kerryth, for taking the time to chat with us. We’re excited to see what you will bring to the Faire!